Click here to see our picks for the best stainless steel cookware. It can be a daunting task to find the best stainless steel cookware, but don't despair! It's not as hard as it looks. Here are a few tips on what to look for so you bring home a set you'll enjoy cooking with for years to come. There are many considerations to take into account as you shop for your cookware. You may have a limited budget, and in that case you'll want to find the best value for your money. After you've taken the following criteria into consideration, choose the best of the lot that suits your budget. The criteria you need to take a look at are the quality of stainless steel that was used, the evenness of cooking, how the handles are attached and if they are easy to grip, the versatility of the cookware, the balance and design, the care requirements and finally, the warranty. First, let's take a look at the quality of the stainless steel. Do you know what stainless steel is? It is an alloy of a few different metals that are blended to create a metal that is better than the ingredients are on their own. Stainless steel gets its name from the fact that it resists corrosion. When we are looking at stainless steel, the components we are interested in are nickel and chromium. Nickel gives protection from rust, makes the alloy hard and makes it shiny. Chromium contributes durability and resistance to rust and corrosion. To be called stainless steel, it must contain a minimum of 11% chromium. 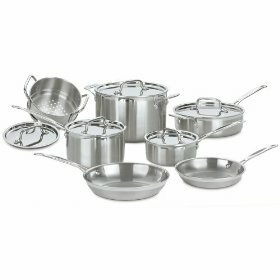 On some high end stainless steel cookware, you may run across a number written as 18/10. This refers to the percentage of chromium (18%) and nickel (10%). The rest of the alloy is made up of iron. In the case of stainless steel, the higher these numbers are, the better quality stainless steel you'll be getting. Another very important quality is how evenly the pans will cook. It is important how your cookware heats so your food will cook evenly. While stainless steel maintains its good looks for a long time and is very durable, it does not conduct heat very well. 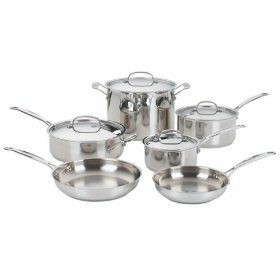 The best stainless steel cookware will have a core in the bottom and sides of the pan of either aluminum or copper. Both of these metals conduct heat quickly and evenly. Copper will usually be more expensive than aluminum, so if you are on a budget, you can still get a good quality by choosing the aluminum core cookware. Next, take a look at the handles. Are they sturdily attached? What are they made of? Does the handle fit comfortably in your hand so you can easily move a hot pan full of food around? The best stainless steel cookware will have handles that are riveted to the body of the pan. They should stay cool while cooking and be molded so they are comfortable in your hand. Next, let's take a look at versatility. Most cookware is made to use on the range top. Are they suitable to go in the oven? Can you use it to store food in the refrigerator? You may want to start a marinade in the pan and let it chill for awhile, and then move it to the oven to bake. Next, take a look at the design and balance. Is the design pleasing to you? Pick up a pan if possible and see if it is well-balanced. A pan that is not well-balanced will be difficult to work with as you move the pan from the stove to the table, or if you need to pour the contents into a serving bowl. What do you need to do to clean and maintain the pans in optimal condition? The best stainless steel cookware will need little fuss to remain shiny and new. You should be able to wash them by hand in warm soapy water without difficulty. Some sets can also be washed in the dishwasher without a problem. Finally, you want to read the warranty. How long is the warranty? The best cookware will have a lifetime warranty that covers all factory defects. The warranty should outline what circumstances void the warranty so you know what not to do with your cookware. Now you're all set to go shopping for your stainless steel cookware. 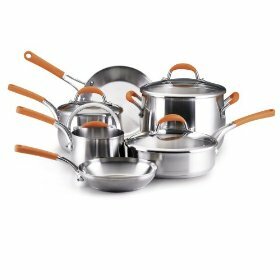 Take notes if you need to, and then compare the different sets to see what fits your budget so you get cookware you will be happy to use for years to come. 1- 8 Quart covered stockpot with lid. Exterior: Has a 18/10 stainless steel mirror finish. The base of the cookware is aluminum encapsulated which heats quickly and spreads heat evenly, eliminating hot spots. The rims are tapered for drip-free pouring. Interior: Stainless steel, which will not discolor, alter flavors or react with food. Perfect for simmering, reduction and rolling boils. Handles: Riveted soild stainless steel handles stay cool on the stovetop, not in the oven. The saute pan has a helper handle for extra support and balance. Dishwasher: These are dishwasher safe but Cuisnart advises that soil from other dishes may be abrasive, that other items in the dishwasher may mar the surface. They also recommend that you do not use lemon detergent when washing them. Where to Buy and Best Price: Most online stores had this set priced at $149.99, but we found that Amazon had this set at a considerable discount and shipped free with super saver shipping. Exterior: Has tri-ply construction with a 18/10 brushed stainless steel finish. The pure aluinum core gives you quick and even heating with any hot spots. Interior: Made with 18/120 stainless steel that is nonreactive to foods. Lids: The tight fitting lids seal in moisture and nutrients when cooking. Lids are made of 18/10 stainless steel. Utensils: Use plastic or wooden utensils, metal untensils may scratch the cooking surface. Cooking with Cuisinart Multi Clad: The tri-ply construction makes this cookware highly conductive and efficient for quick, even heat distribution. That is why Cuisinart gives you a precaution to never cook on high heat, because you will burn your food. Use a low to medium setting for most cooking. If you use a gas stove they warn that even a low setting might overheat and burn some foods. If you experience this problem they recommend that you get a flame tamer. Where to Buy and Best Price: Most online stores sell this set for $299.99. We found that Amazon had this set discounted and was the besy buy. Click here to see today's price and see if you can save some money. Exterior: Made with a satin finished stainless steel. The base of the pans have a thick aluminum base encapsulated in stainless steel. This makes the pans heat quickly and helps spread the heat evenly, reducing those hot spots that can burn foods. Interior: The inside of the pans use the same satin stainless steel as the exterior of the pan. Handles: Double-riveted stainless steel handles with comfortable silicone handles. Dishwasher: Dishwasher safe. But they do recommend washing by hand. Oven: Oven safe to 400°F. Perfect for starting your dish on the stovetop and finishing it in the oven. Where to Buy: List price for this set is around $300.00 but most retailers have this set discounted from $199.95 to $179.95. We found the best price at Amazon and if you use super saver shipping you can get this set shipped free.